A QUITE STUNNING COUNTRY HOUSE BUILT IN 2012 MAKING FULL USE OF TRADITIONAL GREEN OAK CONSTRUCTION COMBINED WITH A CONTEMPORARY SPECIFICATION. Set in an exclusive private cul de sac of just five beautiful homes on the fringe of Anstey village, this impressive home enjoys views over fields and yet is only a few minutes drive from nearby Buntingford and the A10. Both London and Cambridge are easily reached by either the A10 or M11 and rail services are found in neighbouring towns of Ware, Hertford and Royston. This quite exceptional home provides accommodation that extends to in excess of 4,500 sq' arranged over two floors with a large hallway, a beautiful dining hall/family room, a large drawing room, study, a 36' open plan kitchen/breakfast and family room, utility room, cloakroom, boiler room and lobby on the ground floor. On the first floor is an impressive galleried landing, a master bedroom suite with dressing room and en suite shower room, a guest bedroom with en suite, three further bedrooms (one with en suite shower room) and a family bathroom. Outside the plot extends to approximately one third of an acre which is mainly to lawn with large patio to the rear. The large gated driveway provides parking for many vehicles and leads to a Heritage style double car port and a single garage. Utility Room - 16'7 x 14'1 (5.05m x 4.29m) - Fitted with wall and base units, sink and with plumbing for washing machine. Tiled flooring. Garden Lobby - Tiled flooring. Boiler Room - Tiled flooring. Master Bedroom - 19'8 x 13'11 (5.99m x 4.24m) - With high vaulted ceiling, Juliet balcony. 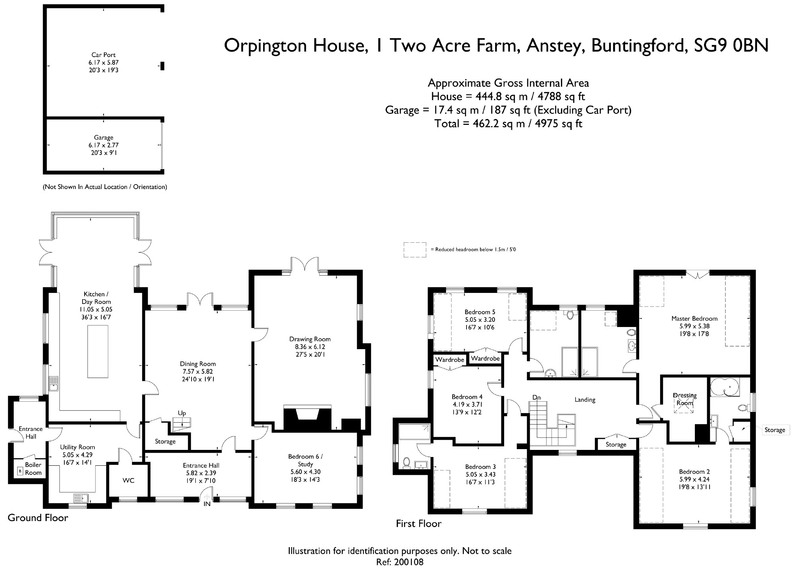 Gardens And Triple Car Port - Overall the plot is of approximately one third of an acre and is laid mainly to lawn and enclosed by mixed hedging and fences. To the very rear of the house is a large patio. Approached at the front by a gated driveway that provides parking for numerous vehicles and leads to a large Oak framed triple car port one of which has an electric roller door. Epc - EPC Rating C.